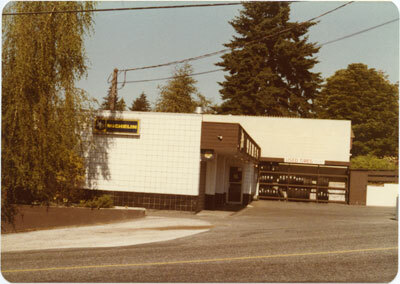 Tire Store corner of 25th Street and Marine Drive, 2504 Marine Drive. Photo shows same building as Big O Tire Store in photo 3209.McP. Scanned October 2011 using Epson Perfection V700 Photo at 300dpi and 100% of original image size. Alternate Versions: Lossless TIF from original scan at 300dpi and 100% of original print. W13 x H9 cm colour print on photo paper.